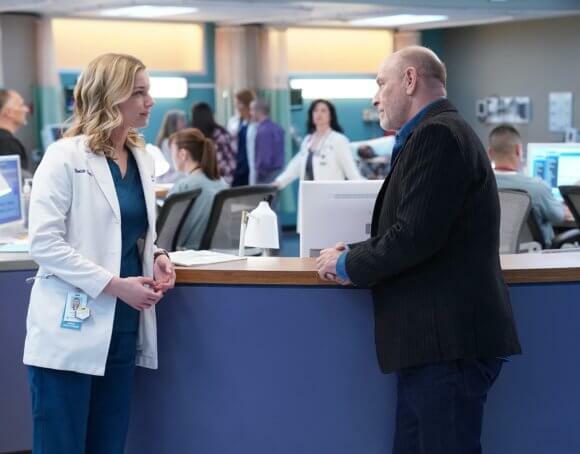 Fox’s popular medical drama The Resident continues with Jenna Dewan, Corbin Bernsen, Julianna Guill, Miles Gaston Villanueva, and Tasso Feldman in guest starring roles. Season two episode 18 titled “Emergency Contact” is set to air on Monday, March 25, 2019 at 8pm ET/PT. The season two cast includes Matt Czuchry as Conrad Hawkins, Bruce Greenwood as Dr. Randolph Bell, Emily VanCamp as Nicolette, and Manish Dayal as Devon Pravesh. Shaunette Renée Wilson is Mina Okafor, Malcolm-Jamal Warner is Dr. AJ Austin, Jane Leeves is Dr. Kit Voss, and Glenn Morshower plays Marshall Winthrop. The “Emergency Contact” Plot: Chastain picks up the pieces after the fall out with the corrupt medical device company Quovadis, leaving Marshall ready to charter new territory in the medical field, and Devon to finally discover the truth about what happened to Julian Booth (guest star Jenna Dewan). As Conrad and Alec team up to help a young gymnast experiencing mysterious symptoms, Nic focuses on her sister, who’s back with their estranged father, Kyle (guest star Corbin Bernsen), in tow. Meanwhile, Bell rushes to Kit’s aid when her ex-husband comes to the ER needing emergency surgery.